Everyone is eagerly waiting for the next OnePlus device aka ‘Flagship Killer of 2017’. But, one of the biggest questions that everyone has in their mind is – ‘What Would be the name of the device?’. OnePlus 4 or 5? Well, rumors and leaks suggest OnePlus 5 because the number ‘4’ is considered bad luck in China. But, even Xiaomi has launched a lot of devices with number ‘4’ in the names, despite the fact that it is a Chinese brand too! Today, however, a new leak has revealed the model number of the next OnePlus phone which has given a big hint about the name. 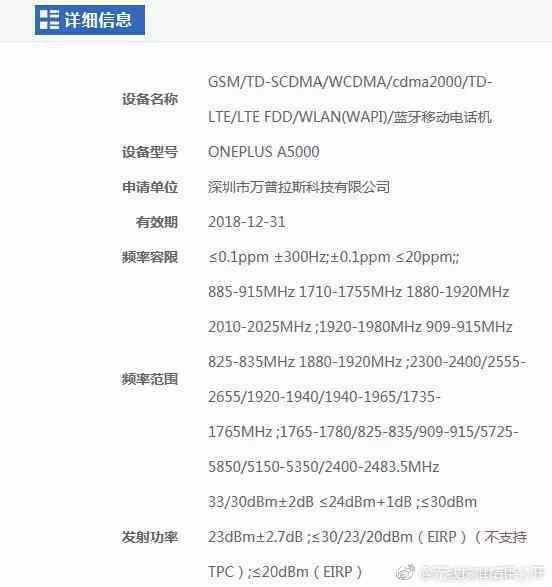 So, A5000 is the model number and before talking about it, let’s first recall the model numbers of previous OnePlus devices. The OnePlus One came with model number A0001, followed by A2000 for OnePlus 2 and A3000 for the OnePlus 3. Now, the model number A5000 surely reveals that the next device from the company is OnePlus 5 and so, the OnePlus 4 is going to be skipped. Talking about the specifications, as per the rumors, the OnePlus 5 will feature a 5.5-inch Quad HD display. It will be powered by Snapdragon 835 processor along with the Adreno 540GPU & 6 or 8GB RAM. Since there is no reliable leak yet, so we have to wait for that. Hopefully, leaksters like Evan Blass are all set to reveal some interesting information about the phone. Stay Tuned.